Knesset Foreign Affairs and Defense Committee Chairman Dichter says the Temple Mount must remain weapons-free, inciters will pay the price. 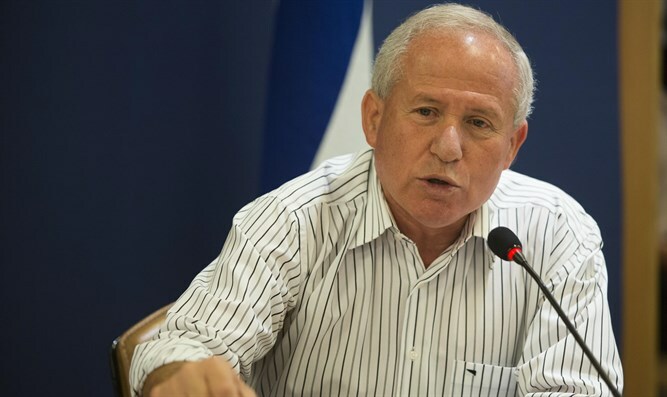 Knesset Foreign Affairs and Defense Committee Chairman Avi Dichter (Likud) spoke on Saturday night about the steps which must be taken to ensure security on the Temple Mount. "The Temple Mount must remain sterile," Dichter said. "We can no longer close our eyes and say that our security forces are the only line between us and terrorism. The security forces, and the Israeli government, cannot afford to repeat their mistake - a mistake which caused a terror attack in which two Border Police officers were murdered." "The battle fought by the Waqf, the Palestinian Authority, and other inciters cannot scare our decision makers. "The magnetometers stationed at the entrances, the observation points, and other technological devices, need to be used to help Israel Police and others carry out security checks on those arriving on the Temple Mount. "We have all of these things at the entrances to the Western Wall, the Knesset, and in Mecca. Anyone who cannot undergo a security check at the entrance to the Temple Mount will need to go via a special route or content himself with viewing pictures of the site. "All of the security forces whose knees shake at the thought of standing up to the Palestinians' murderous and verbal violence are shirking their responsibility to ensure that the Temple Mount does not become a weapons storehouse that terrorists come to in order to receive weapons and carry out attacks - like the one which happened last week. "We experienced airport threats in the 1960s and realized there is no option other than to install technology. The recent terror attack proved we have no choice but to do the same on the Temple Mount. In Arabic there's a saying: Only a donkey makes the same mistake twice. We cannot allow the security forces and politicians to make the same mistake again. We saw the results in the murder of two Border Police. "The Waqf, PA, and other inciters should not scare Israeli decision makers. From now on, the slogan is, 'The Temple Mount is sterile in our hands!' How can we do that? That's a professional decision which has nothing to do with religion. We need to leave that decision to Israel Police and other security agencies. The Arabs and the Jews - and everyone else - will all get used to the new security precautions. "We cannot fear their threats of another intifada. They are fighting us tooth and nail. Israel's Arabs have taken a step back and it will take them time to recover. They understand that. And all of those who are inciting violence now will pay the price later on. "Am Israel chai! (The nation of Israel lives on!) And I can't say the same about the PA when the next intifada ends."